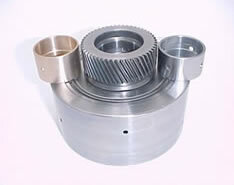 AW-55 50 SN 4-5 Clutch Drum Repair from Omega Machine & Tool Inc. The AW 55-50SN clutch drum bushing is a slow mover. Rather than include it in our kits, when most builders probably won't replace it, we decided to make a separate kit with it and the steel sleeve. The sleeve must be removed to get the bushing out and is destroyed in the process. To see a contributing cause of failures in this transmission, check our repair of the AW55-50&51SN cases.